Ok enough grumbling about the Cubs..The point of this post is to discuss the giant hole at first base in Chicago. Carlos Pena had a good season for us doing exactly what we expected, low average, good on base, high home run totals..but unless he is willing to accept another one year deal, it doesn’t look like Pena will be back. While Epstein has basically decided the Cubs are rebuilding and letting young guys like Castro and top prospect Brett Jackson grow into their positions, we do not have a viable option at first base anywhere in our farm system. Sure 28 year old 4A player Bryan LaHair who got a cup of coffee at the end of last year looked like a solid option, but let’s be honest, he’s the next version of Micah Hoffpauer or Jake Fox. Power potential but no strike zone discipline, once pitchers figure him out he’s done. Do I suggest the Cubs splurge and go all in on Prince Fielder? Maybe. The irrational Go big or go home Cubs fan inside me says yes, but the sensible smart Cubs fan who believes in Theo Epstein’s ways says maybe not. What I would like to see the Cubs do is aquire a first base prospect whose current team thinks they might be a bust. Someone like a Chris Davis or Matt Gamel type player. With the Cubs knowing they aren’t going to contend this year, we should give a player like this an oppurtunity to see if they can find a way to put things together with a full season of play. I know this normally is not the Cubs style of doing things, but with a new GM and President things could change. Now, if Prince Fielder can be had for a decent price and limited number of years, I say go for it. With the Brewers signing Aramis Ramirez and Prince being pretty young still at 27 years old, he is a solid piece to build a team around while providing some thump in our lineup with no more Ramirez and Pena around. A (Topps) Tribute to Nomar! As many of you who follow my blog know, my all time favorite baseball player is Nomar Garciaparra, from his 1997 Rooke of the Year campaign to his jaw jopping trade to the Chicago Cubs (my dream come true) Nomar has always been a great hero of mine and somebody I deffinitely idolize. I try to collect as many Nomar cards as I can afford (they are awfully expensive on the bay) But once Nomar lost his superstar status and faded into washed up utility player hell, his cards became scarce and he was barely included in base sets. It also didn’t help that Nomar and Topps could not agree on a contract, and Topps quit producing Nomar cards after 2006. But that all changed in 2011, thanks to Topps Tribute. for the first time in a long time, Nomar Garciaparra was finally treated like a superstar again. I’m not sure about the rest of you, but I really like the design of Topps Tribute. I think its high tech and fancy while still being simple and unique. This is the green parallel numbered /75 and it is a LOT nicer in person then from the scan. Their are many different variations, so the green version is quite common, but still a very nice card. 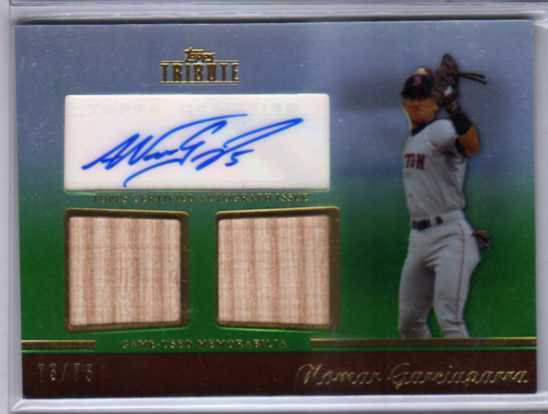 Thanks to Topps Tribute paving the way for the return of Nomar Garciaparra cards, Topps Triple Threads has also included him in their product, producing a rainbow of single bat relic cards. I have the red parallel numbered /36 I believe, and it also looks very nice and shiny. Here’s hoping 2011 is just the beginning, and Nomar Garciaparra will return in full force in 2012 products! 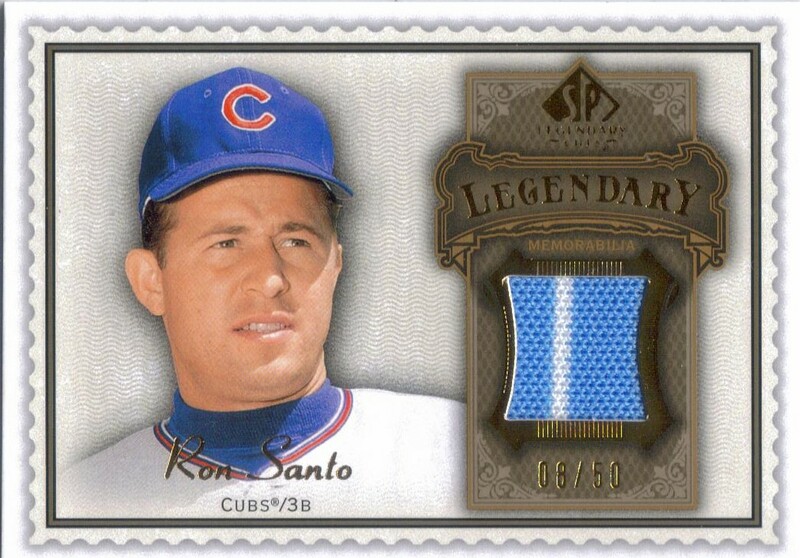 By now this story is old news, but as a die-hard Cubs fan, I feel compelled to write about Ron Santo’s long overdue induction into the Hall of Fame. While Ron’s playing days where a little before my time, his broadcasting days were what got me so excited to listen to a Cubs game while driving home, or sitting outside in the backyard. Although Santo might not have been the greatest broadcaster ever (or the most informed) He was by far the funniest. For those of you who have never heard Santo broadcast a game, it was unreal. He would ramble on for innings about stories he knew nothing about, butcher player’s names worse then Harry Caray, and drive his partner Pat Hughes crazy. It’s all of these elements, along with being one of the biggest Cubs fans in history, that make Ron Santo so special to me. He is as synonymous with the Cubs as the ivy covered walls in the outfield, historic Wrigley Field, or even the dreaded Curse of the Billy Goat. Santo is forever a part of the Chicago Cubs, and a part of baseball history that future generations who were not able to see him play or listen to him speak, need to learn about. By Santo going into the Hall of Fame, his stories will live on. One of my greatest acomplishments since leaving the blog was the huge additions made to my Jeff Samardzija PC. Samardzija is always a guy I try to collect hard, and since there are so many Nomar Garciaparra cards and collectors of him out their, there is no chance for me to be the number one Nomar collector. With Samardzija, that goal is much more realistic, as there are only a handfull of people collecting him, which also makes his cards much more affordable then Nomar’s. 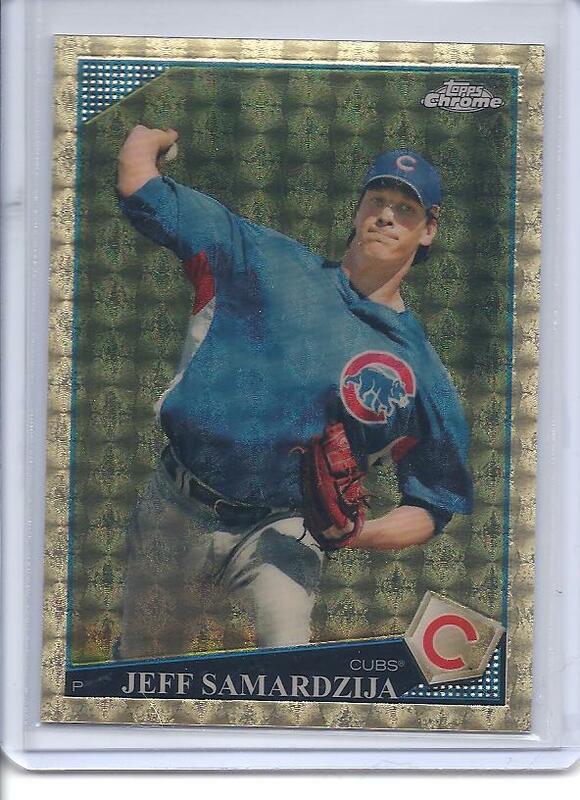 If you recall, I once wrote a post about the previous number one Jeff Samardzija collector. But since that time, he has sold off his entire collection for various reasons; the majority of it sold on ebay. Naturally, I went ahead and bought a great deal of his rare Samardzija cards, and if I had more money and no fear of sleeping on the couch for a week, I would’ve bought all of them. But I am not greedy and was thankful for the cards I did obtain. I will do my best to show off the highlights, but I’d say I purchased about 40 new cards from him, the majority being 1/1’s. Many of them printing plates and uncirculated 1/1’s. But the big catch was this bad boy…. This is my very first (and only) superfractor, and I could not have been happier. The other reason this card is so special to me is it completed my ultimate 2009 Topps Samardzija rainbow, covering all versions of his Series one and Topps Chrome base cards from 2009.
so with these numbers, and the fact that the previous number one Samardzija collector is no more, I am curious to know, does this make me the number one Jeff Samardzija collector out their? From the few collectors of him that I have met, the answer would be yes, but the world is a big place and I’m sure there are plenty of Samardzija collectors out their I have not met. Only time will tell, but as long as people collect baseball cards, I’ll keep looking for new ones to add to my collection..and as you can tell from the above stats, I am not even close to being done yet. I have decided to start writing again. For how long or how often that is, I am not sure. But while browsing the internet and reading through some familiar blogs I check up on every now and then, I felt the urge to post some things. I have thought about this blog and all the great people I have met since blogging, and I kinda missed it.I have not stopped collecting since my last post on here, and while my collecting focus has narrowed quite a bit, I still enjoy baseball cards just as much as I did a year ago. Hopefully I can make a successful return after being away for so long, and hopefully you readers out their will be interested in what I have to say. 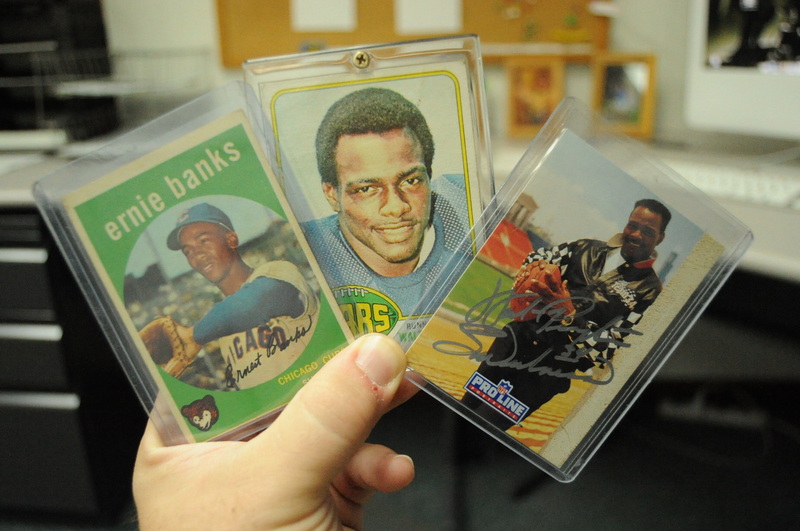 For now, be on the lookout for some new reading material from on card autos! It’s been several months since I’ve written anything on here. I have thought about this blog many times since my last post but never could get around to writing something up. I know I promised to return in the offseason and write about current baseball-related news, but obviously that didn’t work out. So why did I fall through on my promise? Well the biggest reason was that I had just lost all interest what-so-ever in baseball cards. None of the products that came out interested me at all, and I just didn’t care to buy any singles off ebay or make trades anymore. With no new Samardzija or Nomar cards coming out for almost a year, I just gave up. While I still have a decent portion of my collection left (My player PC’s and my ALL my Cubs cards remain) Everything else is gone and I feel alot better that way. 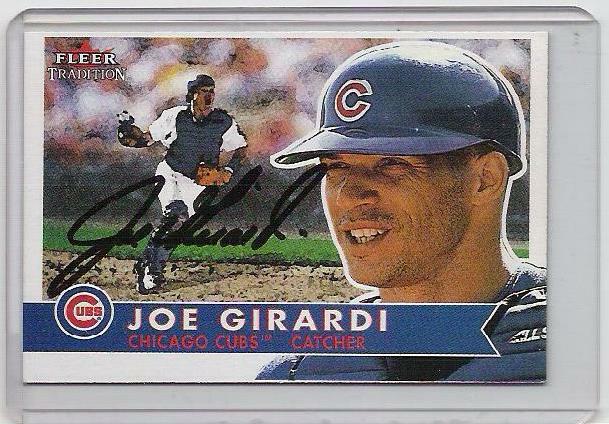 I still like baseball cards, and I wont be getting rid of my PC anytime soon, but I certainly don’t feel that same spark I used to get when I would browse ebay or read people’s blogs, drooling over the cards they had featured. So with everything going on in my life, I have decided to formally cut ties with the blog I have grown to love. It has been one awesome ride, while meeting many new friends and making many great trades along the way. Without all the support from my readers and fellow bloggers, I wouldn’t own some of the amazing cards that are currently sitting in my collection today. So thanks to everyone out their for making this blog such a fun and exciting success! and who knows? Maybe I will return to part-time writing in the near future…. But until then, thanks for the memories and keep the hobby alive! Sometimes just a simple question can spark a morning of debate. Normal work routine has me listening to Chicago sports talk radio as they usually trigger my a.m. brain movement more than any pounding at the desk would. And being a Chicago sports fanatic – yes fanatic – thinking about the Bears or Cubs or Hawks first thing in the morning is not only routine but desired. So I had on the radio and the World Series was brought up in comparison to weekend numbers for the NFL. And with two games this weekend between the Giants and Rangers, they went head-to-head against the monsters that are college and pro football. And barely kept pace. The Game 3 win by Texas, played in one of the top TV markets in the United States in Dallas, drew just a 6.7 overnight rating, the second-lowest rating ever to the 2008 Philly-Tampa game that was delayed by rain. The pivotal Game 4 did rise to a 10.4 mark, but going directly against the Saints-Steelers game which drew an 11.8 and the game prior to the WS game, Minnesota at New England, drew a 17.0 as Favre got his face split open and ego chucked while Randy Moss declared that he is not talking to anyone but himself the rest of the season. Fine. What does it all mean? Well, for one, baseball needs to revisit its schedule. I’m not a financial guru or even armchair GM, but MLB really needs to look at retracting its schedule to either 154 or 144 games. The inclusion of the Wild Card and off days (let’s face it, for advertising on TV purposes) draws the postseason out another two to three weeks. Right into the heart of the NFL schedule. Baseball would be wise to shorten its season with the regular season ending in early September. The sports buzz is at a yearly high in September, but the NFL animal is just beginning. To market against the NFL in September would be a smarter choice than late October and November when the NFL is firmly reestablishing itself in households. While MLB may not win the ratings battle, it won’t be faced with mid-season storylines that have built itself over half an NFL season – Moss returning to New England after being traded just weeks prior and Pittsburgh heading to New Orleans in primetime. Even college football is still working out its contractual tweeks in September when most conferences are getting its mandatory 12th game in when Ohio St. takes on Youngstown St. and Penn St. hosts Temple. The radio conversation also begged of the matchup. Does anyone really care if the feel-good Giants and ever more feel-good Rangers play each other? Ratings says no. Purists say yes. The east coast media and pundits say no. Would the Cubs make the World Series any more watchable? Absolutely. There are few teams in sports that carry weight like the Cubs. For all the ballywho and Lovable Loser crap that comes with the franchise, there is also a very wide and ardent fanbase. The Yanks and Red Sox may be the only other two teams in the league that can bring fans on the road like the Cubs can. Just think back to the 2003 playoffs (I know, the PAIN), but Atlanta was referred to as “Wrigley South” and Dolphin Stadium was at least half full (pun) of Cubs fans for the Marlins series. A trip to Cincinnati during the regular season three years ago, just for a weekend set with the Reds, easily had half of the red seats in Cincinnati filled with Cubby Blue. Myself included for three games. While everyone is either love ’em or hate ’em, the Yankees, Dallas Cowboys, Brett Favre, Notre Dame football, Duke basketball and the Cubs just draw. Doesn’t matter if they are good or bad. The Cowboys game against the Jaguars in Dallas had a similar TV ratings as the Rangers playing in the same city on the same day, and the Cowboys are horrible and playing without its franchise quarterback. The Cubs would also have the allure of the 102-year media tag, and there would be no end to the ESPN overhype and the Fox fan shots of the same four ladies in the crowd holding their hands over their mouthes desperately waiting to see if Zambrano can strike out the side in the third inning and the guy wearing the pink hat behind home plate would ever show a smile. And the seat where Bartman sat, the Billy Goat Tavern, the jamooks on Waveland with their fishing nets and Old Styles, all the circumstance. It just comes with the product. It may not be able to save the slow death that is the MLB postseason, but it would certainly inject a fire. So C’Mon Cubs, do something about it. It’s been bantied about this fall as to what is the next big move. The Major League Baseball hot stove is always smoking, but it seems like for the Cubs in particular, so much is still in question. It is usually a revolving door in the modern world that players have no loyalty to a ball club, and vice versa when big dollars are being exchanged on a nominal basis. Bonuses, endorsements and business ventures seem to carry as much weight as the jersey on the back, if not more for some of the biggest names in the business. Rare is an occasion when a mega deal is made and a player actually honors the contract – Re: Derek Jeter playing out the string on his 10-year, $180+ million contract with the same club. While Jeter might be an exception on multiple fronts, emblematic as the face of the most notable franchise in the world, it makes one wonder why GMs bother to make contracts more than two years. Re: Jim Hendry. The Cubs have a lot of work to do to get back to the level they set for a good portion of the past decade. The hiring of Mike Quade, while an interesting one, makes a lot of sense from the vantage point that the recent Cubs managerial hirings have been mostly for show, and for too much dough. In Quade, you have someone who has paid his dues (19 years of sub-level coaching) and a man whom sounded as thrilled as anyone during his hiring press conference to have the managerial position full-time. Lou was on his way out the door. Dusty was interested in Dusty. Jim Riggleman and Don Baylor didn’t seem to fit well within the organization. The hype machine during the final month of the season into the postseason centered around two former Cubs in Ryne Sandberg and Joe Girardi. While both guys have great claims to Cubs lore, Sandberg being the most obvious, both would come with a caviat. Girardi was going to cost a lot of money to bring in. With the mammoth contracts of Soriano, Zambrano, Fukudome and Ramirez already on the books, adding manager money was going to make any player personnel movement virtually impossible. Most notably if the Cubs ever wanted to deal for a mid-season star replacement. Sandberg comes with the hero tag. What Quade has is anonymity, a little bit of a leash to work with because his product is not in place. Sandberg brings attention. And lots of it. Not necessarily on himself – he did work through four years of bus rides as was asked of – but the expectation that he is a Cubs legend. The spotlight would burn brighter, the adoration a little stronger. With a team that is in need of a major rebuilding job, in my humble opinion, having Sandberg in the fray would only bring unnecessary attention to the franchise. Is he here as a sideshow, while the club is 72-80 next season? Or is he taking responsibility for the club while those in attendance can look past the #23 and focus on the product? Where would Cub fans stand after two seasons of .435 baseball with Sandberg as the face of that winning percentage? Chicago sports fans are loyal to their heroes – John Paxson still has a GM job with the Bulls despite some major embarrassments in past seasons, the ’85 Bears can do no wrong – EVER – and the Cubs are one of the best draws in pro sports with 102 years of misery over their heads. I think Quade is better prepared for the responsibility of the manager’s role of the Chicago Cubs in 2011. Sandberg may still be a great manager down the line, and Girardi has obviously done it at the highest level in New York. But for 2011, temper the expectations and let Mike Quade do something much needed in this town, build from within. A big thanks goes out to Mike for writing up another post and keeping oncardautos alive while I am away, enjoy the piece guys! We’ve all encountered a time or several hundred where we are either online, at a show or in a store and saw the White Whale. The Honus Wagner T206 of our eye, no matter how shiny, tattered or expensive it might be. For some, it could be a rookie card of a childhood hero. For others, a Superfractor Stephen Strasburg that is all the rage, even to ESPN’s here-today-gone-tomorrow standards. We have to have it. But unless you have Bruce McNall and Wayne Gretzky money to buy that Wagner card, obtaining the Whale can be tricky. Taking a cue from Chris, collecting these days has become somewhat of a menace. Hobby stores have become obsolete in many necks of the woods, card shows often feature the same allotment of the same crap at the same overpriced mark. A blog friend of mine, Matt Flaten over at Heartbreaking Cards of Staggering Genius, recently wrote that his trials through a card show was finding old vintage just to see how much old vintage he could buy with a few bucks. So in these times of $300 hobby boxes and four-figure autos, how can a collector get what they want without having to take on two side jobs? I’m in the second boat. As written before, I’m on the quest to find all things Walter Payton and I’m close to doing that. I’m at 16 Payton’s and counting away from checking off my entire list. Not bad considering my resources. But I’ve had to get creative. In my case, the nearest card show is 45 minutes away, the nearest dealer is over an hour away and I’m resigned to internetting most of my goods. So I’ve had to figure a budget. But I’m still getting what I want. Ticket A) Some “eBay” dealers will haggle prices. If they have a Best Offer option, use it. I include a sincere message with my offer, and I have had success lowering a buying price. Ticket B) Shop around. The more I wander the net, the more I find. The only major hurdle in a lot of shopping has been shipping costs, but I guess welcome to 2010. Ticket C) Find someone who will deal with what you want. I happened to stumble upon a guy in Mass named Lee Hahs who used to live in Illinois, and has a ton of Payton stuff on his eBay page. Not only did I get a couple very nice cards from him at a nice price, but he had a whole bunch of old school childhood memories in his personal collection that made its way to me. I check in with Lee often, and we’ve actually made a nice set of deals. Ticket D) Be persistent. While this doesn’t work for some people, others may come down. I’ve never understood the “That is the best I can do” line on a price, unless you are so stiff on your prices that your company overhead will suffer from a couple bucks off a product. If the $5 for the pack is covered by price of the card so be it, but in all likelihood, profit margins are not the end all be all on one card. It’s hard for a seller to say no when his card has been priced online unchanged for eight to 12 months. Unsold cards is bad business. I’ve noticed a lot of bloggers network together in setting up trades, and this might be the best way to get your Whale, if you can find the right person. In any rate, be persistent and exhibit patience. And eventually, you can reel in your White Whale. I’m sure it has become obvious that my work on this blog as been less then steller lately. I have had no time to blog, and when I do have time, I just don’t seem to have enough passion for it anymore. It’s largely due to the fact that I have lost 99% of interest in our hobby. 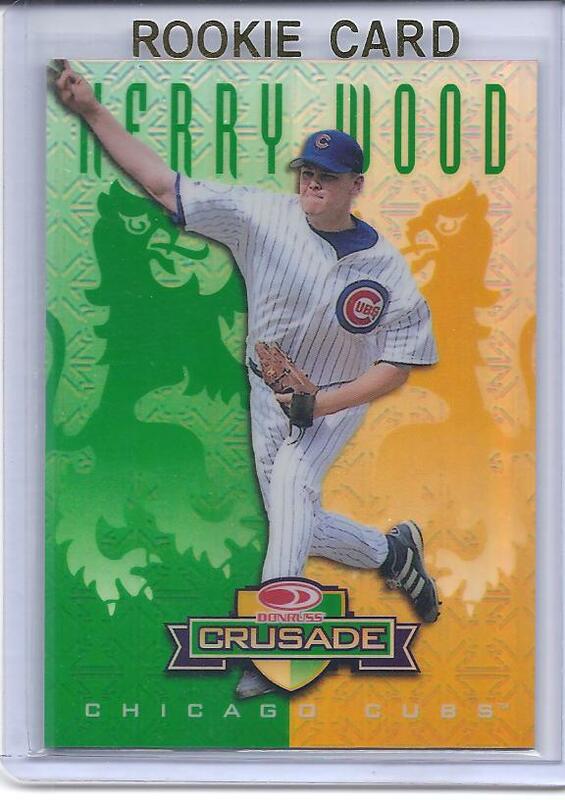 There hasn’t been a new Samardzija card on ebay in weeks, and I just haven’t seen any Nomar cards that have peaked my interest. So with that, and the fact that baseball cards have just been overpriced, unoriginal, crap lately, have just made me give up on the hobby. With that being said, I still have a passion for the game of baseball, and will still want to write about the game of baseball, so I will be back to writing very soon, once the offseason trade and free agent signings begin. I plan to have full coverage on the latest offseason hot stove rumors so please check back after the playoffs are over. This deffinitly isn’t the end of on card autos, but rather, a new chapter in the blog’s life. And I’m hoping that Mike, our guest writer here, will be able to hold reader’s interest until the offseason begins. I’ll be back soon guys, and thanks for all the support! William R. on Congrats Ronnie!